With just about every classic arcade concept getting a fresh coat of paint, especially in mobile game marketplaces, I'm a little surprised I haven't noticed a Qix update until now. 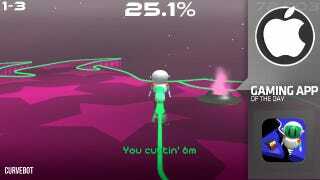 Elpixo's CurveBot, for all iOS devices, takes Taito's territory-marking game and brings it into a third-person view. The product is, surprisingly, more playable than one would expect given the limited perspective. Qix's mandate was to nibble off pieces of the board, and if the Qix crossed your cutting path that was as good as death. CurveBot's lack of death and use of powerups encourage you to get creative and use your cutting tool more aggressively. The point of the game is still to lop off sections of the playing surface, but in CurveBot the goal is to "liberate" one or more "Fiery Friends," stationary firepots often placed at extreme ends of the board. You can't separate them, so any line that would cut one out of the board is nixed, and you must start over. There to thwart you are robot drones that can cancel out your cutline if they cross its path. So a winning strategy is usually to isolate the drones first and then, with a board free of their menace, figure out the winding path that unites the Fiery Friends. Carving out territory holding power-up "Clever Coins" will allow you to freeze the drones, will give you an invulnerable line for one cut, or will extend a speed boost that you can acquire with a "Boost Ball". The game also incentivizes keeping a clean sheet by giving you a "tail" that grows with every segment you cut that's greater than 1 percent. A longer tail multiplies your score but, more importantly, extends your boost time. That's critical when you wheel around the perimeter and find two drones idling on a peninsula, and must act fast. My only quibble with CurveBot is the inability to freelook, though I'm not sure how that could be implemented. The boards are creatively built, taking the shapes of whales, crabs, bunnies, stars, Pac-Man ghosts, etc. So when you find yourself on a jagged edge of the perimeter it can be difficult to align CurveBot to start a precise cut. The controls are simple and become second nature after the tutorial section. A button on the left turns CurveBot to the left; ditto the right. You begin a cut by pressing both, which sends you out into the middle of the board. Tapping both while in the middle of the board activates your boost. The game scores your performance based on how many cuts you made, how much of the board you cut (the level advances once you lop off 80.1 percent or more), and how long your "tail" is. That translates into a star score at the end of each segment, encouraging you to go back and play as perfectly as possible. The key strategy there would be the fewest cuts possible, although there are multipliers for isolating multiple drones. CurveBot's camera is its only drawback, and on its more difficult levels, even with all the drones removed it can take a time-consuming feat of spatial memory to get to that 80 percent. Still, it offers a strong pick-up-and-play appeal, and I really appreciated the recap at the end of each level, showing me all the cuts I made and the drones they took out. CurveBot gives you 60 levels for $1.99 and I'm probably halfway through as of writing. It was moved quickly from my "Review" folder into my main collection of games. I have a flight coming up Wednesday and I expect CurveBot will help the hours melt away.